Search Results for "cigarette burn"
Burning Cigarette in Full Ashtray. Speed up. 1960s: Smoke flows from burning cigarette. Smoke rises from cigarettes attached to laboratory glassware. Smoke rises from multiple burning cigarettes. 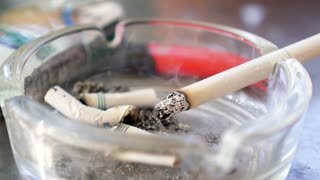 A cigarette burning on dark background. A time lapse of a cigarette burning into ash. Close up of a cigarette burning in a glass ashtray. 1980s: Fingers run along bus seat back, pull ripped vinyl fabric forward. Frayed threads, worn piping, fingers press ripped fabric cover to expose foam. Pencil probes fabric around cigarette burn. 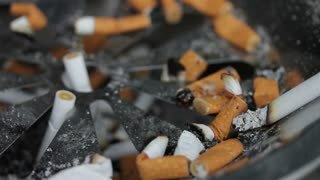 A time lapse of cigarettes burning into ash.